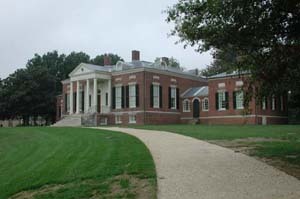 8:00 a.m., Nov. 1, 2002--Homewood House, a museum and national historic landmark on the Johns Hopkins University campus, celebrates its 200th anniversary this year with the help of two University of Delaware professors. Built starting in 1801 by Charles Carroll, one of the signers of the Declaration of Independence, as a wedding gift to his son, the 130-acre farm, two miles from downtown Baltimore, is the centerpiece of Johns Hopkins Homewood campus. Hopkins is celebrating the event with a commemorative exhibit, entitled Building Homewood: Vision for a Villa, that runs through Dec. 29, at the Homewood House Museum, 3400 Charles St., Baltimore. While much is known about the architecture of the house, theres little information about how Homewood was designed and used or the relationship between the building and its landscape. To shed light on these historical aspects, Damie Stillman, UD professor emeritus of art history, Bernard Herman, Rosenberg Professor of Art History and director of UDs Center for American Material Culture Studies, Edward Shull, landscape architect and founder of the Southern Garden History Society, were commissioned to examine Homewood Houses past. Their findings form the basis of the Building Homewood exhibition. Herman was asked to delve into the sociology of the house. There was very little evidence of how space was used, he said. No letter details life in and around the house, no lengthy architectural description penned for reasons of insurance or sale survives. Because the written record is sparse, Herman had to piece together a picture of life there by studying the houses physical characteristics or how the house was used. The physical character of Homewood is a document in its own right, one that invites a reading of its history in brick and wood, shedding light on the ways in which Charles, and to a lesser extent, Harriet, saw themselves and their households, Herman writes in the essay that accompanies the exhibit. What he found was that while the design of the house reflects the young Carrolls sense of style and independence, limitations to that design during construction reflect his fathers strategic parsimony. The elder Carroll paid for the construction of the house. 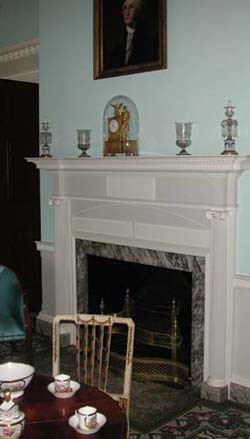 Stillman found that the younger Carroll designed the house with suggestions from his wife, Harriet, and examples of similar structures of the time. The design is based on the concept of a suburban villa then in fashion in Europe that originated in ancient Rome with the Roman Pantheon and its columns and stairs, combined with a small version of a plantation, he said. 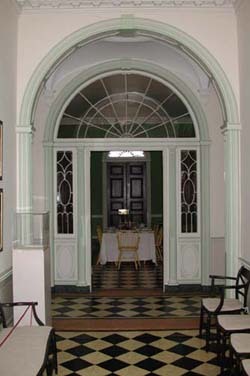 Another characteristic that made Homewood House a villa was its setting. Almost always suburban, the goal was to have a house that was less formal than town homes, smaller and in a garden or plantation-style setting. It was an attempt to get away from the city to a country setting, while staying close enough to the city to accommodate work and society. Homewoods architecture combines the villa with a more traditional Maryland country house design. Somewhat less formal than a great country house, they almost look like jewel boxes, Stillman said.